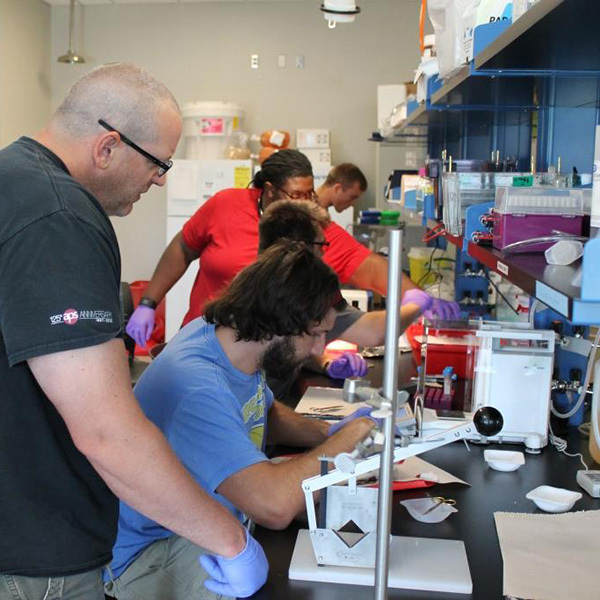 Dr. Michael Roberts, Assistant Professor in the School of Kinesiology and Director of the Molecular and Applied Science Lab, has recently received a large research grant from the University of Tampa. A majority of these funds are being used for the first phase of an eventual two-phase study through 2017 to investigate how aging affects stem cells in different tissues. Phase I began in October 2015 and is currently underway. In this phase, the researchers obtain heart, liver, skeletal muscle, bone, and brain tissue from rats at various ages across the life span to analyze stem cell content. The end goal of this research study is to improve the overall quality of life in humans during aging. Roberts is working with Dr. Jeff Martin, Chair and Assistant Professor of Cell Biology and Physiology at the Edward Via College of Osteopathic Medicine (VCOM)-Auburn Campus, who will test the effects of aging on cardiac function in the rats using echocardiogram (cardiac ultrasound). Roberts is also collaborating with Drs. Kaelin Young and Darren Beck, Assistant Professors of Cell Biology and Physiology at the VCOM-Auburn Campus, who will test the effects of aging on markers of bone health. Dr. Beck and Dr. Young use CT scans, a type of X-ray test that produces cross-sectional images of bones collected from the rodents in order to obtain volumetric measurements of bone morphology and strength. Importantly, this research grant would not be possible without Dr. Jacob Wilson, CEO and co-founder of The Applied Science and Performance Institute, and his laboratory coordinator, Ryan Lowery. The Institute has consistently funded projects in Dr. Roberts’ laboratory. This is a perfect marriage because both of our laboratories share common interests in skeletal muscle physiology in relation to diet, exercise, and aging. The charge for Phase II funding is led by Dr. Wilson and Mr. Lowery, and will involve methods to ameliorate aging and preserve tissue function and health in older rats. Dr. Roberts is currently preparing applications for the Auburn University Animal Care and Use Program and Biological Use Authorization for approval of the study.